We're yet to meet a retailer who finds it easy to report, solve and prevent crime in their stores. We recently shared our experiences of re-imagining retail crime reporting. Getting good intel from stores is a great first step, but it’s what you do with that intel that can disrupt crime at your stores. Reporting crime without outcomes is just another cost of doing business, and to put it frankly, a waste of time. Wouldn't it be nice if all your intel started to WORK FOR YOU to help solve more crime across your stores? Our data shows that just 10% of subjects are responsible for 50% of the loss. These subjects are generally professional shoplifters or Organized Retail Crime (ORC) groups that have a disproportionate impact on you and your organization. So focusing on the people, rather than just the incidents, is a great way to start. Many systems we’ve seen AP/LP teams use do a decent job as a system of record for each event that occurs in their stores. But they don’t make it easy to identify and build connections between subjects, accomplices, and vehicles across multiple events. Therefore, it makes sense that a system should be built around connecting events to subjects and accomplices rather than the events themselves. In our research we observed how challenging it can be for investigators to connect the dots on events happening across their store network. And even in a store environment, the store team may know they have apprehended a repeat person, but it is too difficult for them to find the person in their system or link a new incident to them. This slows down the process of identifying repeat people. 1. Make linking events to repeat people easy! 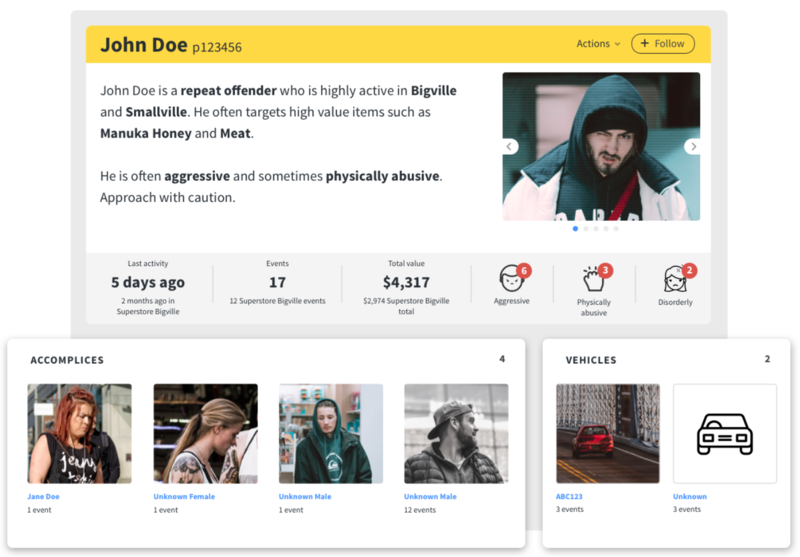 When store teams or investigators are dealing with a known person and reporting a new crime, they want to connect them straight away. A person lookup embedded in the crime event report can match people by a number of variables such as name (e.g. John) quickly, even matching on descriptions like "blue contacts", "red hoodie", or "scar on left cheek". We need to make it easier for investigators to connect the dots and navigate between the people involved in the events and the individual events themselves. These days, it is difficult to get outcomes with law enforcement for an individual incident. A reduction of resources, the low ROI for such a police investigation, and the perceived potential for poor quality information, means that it is important for a case to be built that showcases the totality of offending and brings together all the evidence from every event into one place. With a system of intelligence that does the heavy lifting, investigators can simply be notified when someone becomes a repeat subject and begin to build their case. In the United States some states are passing ORC laws, like AB 1065 in California, where the ability to easily build, investigate, and aggregate cases becomes even more critical for retailers. 3. Get alerted as soon as someone has been linked to multiple events. Unfortunately at the moment, the perceived risk/reward ratio for professional shoplifters and ORC groups is out of balance - they perceive a low risk of being stopped coupled with the high reward of profiting from shoplifting and fencing. We believe solving crime effectively in your stores requires having access to actionable intelligence and being able to collaborate effectively with other stakeholders, such as store teams and law enforcement, as highlighted in this recent podcast on the power of Data Network Effects. If you get the crime reporting process right then software can enable retailers to work smarter, not harder, to solve crime in your stores. Let’s tilt that risk/reward ratio back in favour of retailers!